On 25th July 2014, the London International Youth Science Forum held the Student Poster Board Evening at the Science Forum Bazaar. In the Bazaar, students chose to present their research projects that they completed prior to coming to LIYSF. It was an outstanding opportunity for them to showcase their new and exciting ideas to the rest of the participants. The atmosphere in the Imperial College Atrium and Mechanical Engineering Foyer was electric! It was just as expected when over 400 like-minded individuals gather around together to talk about something they were all really passionate about. There were participants from all around the world presenting their projects, and every single one of them spent as much time as they could putting up their posters, making their stands look as attractive as possible. The rest of the students were also very enthusiastic to hear about their friends’ work. Edi is a high school student from Kosova who wants to pursue a degree in Medicine at University. 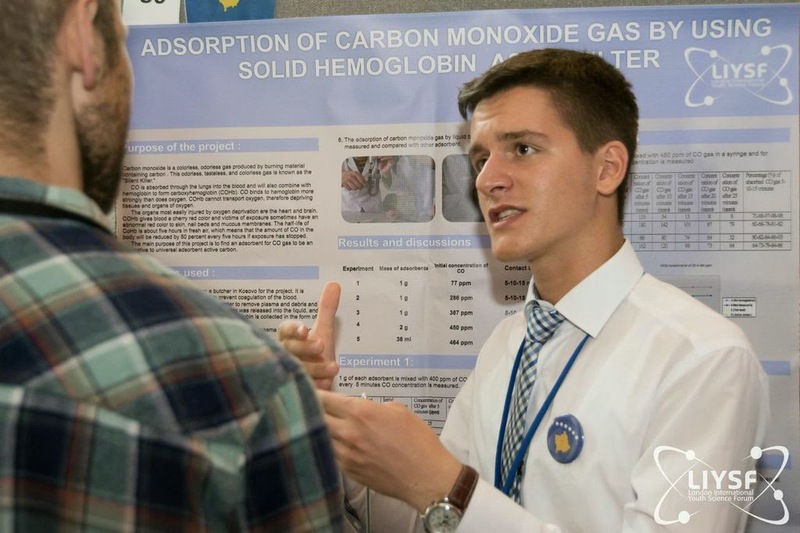 His project is about isolating dry powdered haemoglobin present in cow blood, from the butchers. This powder can be used as a carbon monoxide detector since it changes its colour from bright red to cherry red. The implications of this project can be very major since carbon monoxide poisoning kills around 50 people every year in the UK and this detector can prevent it. It is also cheaper than commercially available CO detectors. Edi was inspired to do this project after hearing about a campaign in the UK several years ago against CO poisoning. Marina is in 2nd year of University, pursuing a degree in Environmental Engineering. After using natural fibres as part of a previous project, Marina realised that those fibres have excellent adsorption properties. So she designed experiments involving palm, banana and coconut fibres. She then tested them to see if they can be used to remove leachates in landfill sites, which can be toxic if not removed. It was concluded that palm fibres worked best since they removed 99% of the leachates! The main advantage of using these fibres is that in Brazil, people throw away a lot of these fibres in the trash – so Marina is treating waste with waste! After, looking at these results, she wants to test various other fibres for the removal of leachates. Filipe is studying Physics in Lisbon University. 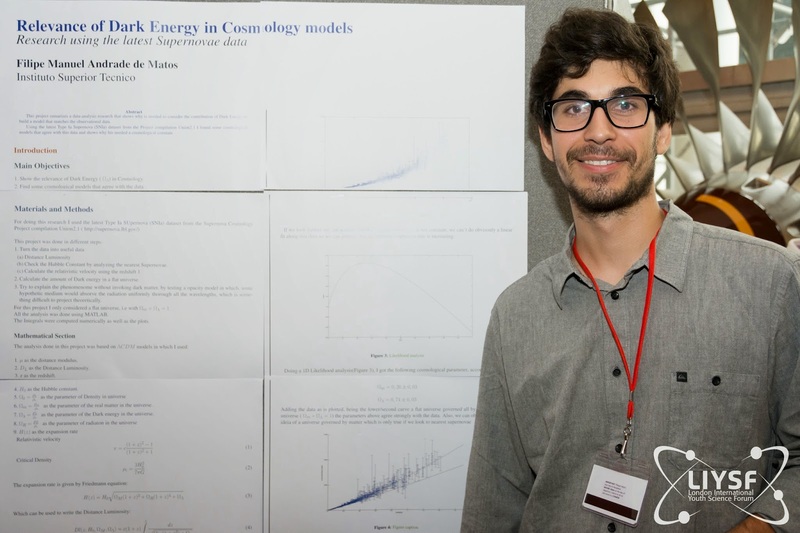 As part of a research project completed at university, Filipe used supernovae data to learn about dark energy that has not been ‘seen’ yet and is only a theory. After analyzing the data, it was concluded that the dark energy is not only necessary for our Universe; it is also a dominant part of it. In fact, he calculated that 74% of our universe is filled with dark energy. He also confirmed that the universe is expanding but not linearly, and this is caused by the dark energy. Check out some projects from last year’s bazaar here and here. Click here to learn more about the London International Youth Science Forum!